Discussion in 'General Freemasonry Discussion' started by Bryan, Aug 30, 2009. The Grand Lodges of Texas and Louisiana have a very special and unique relationship. We are so much more than just neighbors and brothers in masonry. The Grand Lodge of Louisiana chartered the Grand Lodge of Texas and ever since that time we have been the strongest of masonic allies. This special relationship is evident even today as Tranquility Lodge No. 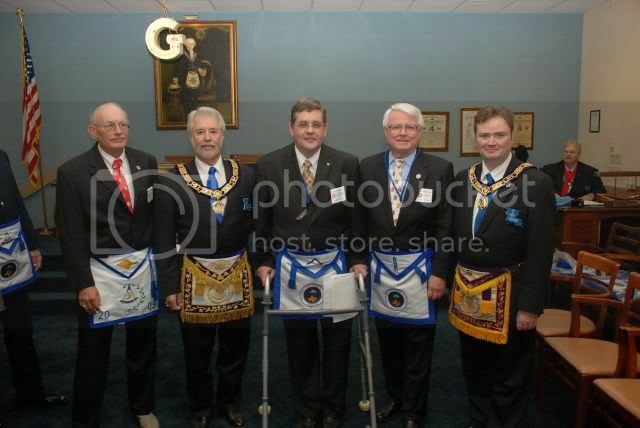 2000 (or the Moon Lodge) of the Grand Lodge of Texas met outside of Texas for the first time ever on Saturday, August 29, 2009 in at Alexandria Lodge No. 398 in Alexandria Louisiana. Both the Grand Lodge of Louisiana and the Grand Lodge of Texas issued special dispensations for this meeting to take place. There were some 89 brethren present including many of the Grand Lodge officers from both Grand Lodges of Texas and Louisiana. On July 20, 1969, two American Astronauts landed on the moon of the planet Earth, in an area known as Mare Tranquilitatis , or "Sea of Tranquility". One of those brave men was Brother Edwin Eugene (Buzz) Aldrin, Jr., a member of Clear Lake Lodge No. 1417, AF&AM, Seabrook, Texas. Brother Aldrin carried with him SPECIAL DEPUTATION of then Grand Master J. Guy Smith, constituting and appointing Brother Aldrin as Special Deputy of the Grand Master, granting unto him full power in the premises to represent the Grand Master as such and authorize him to claim Masonic Territorial Jurisdiction for The Most Worshipful Grand Lodge of Texas, Ancient Free and Accepted Masons, on The Moon, and directed that he make due return of his acts. Brother Aldrin certified that the SPECIAL DEPUTATION was carried by him to the Moon on July 20, 1969. This is so cool. It's kinda strange to see the MWGM wearing a JW jewel. Thanks for sharing ,Worshipful. My thoughts exactly Bro. Sonny. Is that the first picture you have seen of BOTH of your GMs together? In fact, no. Somewhere around here I have a picture with both my GMs. Them GLoLA Brethren got some cool aprons, don't they? gees that's a high quality camera. btw, will they be doing it again? So, what was the purpose of the meeting other than Fellowship? Kinda curious. Both Grandmasters suggested that Tranquility Lodge would perhaps meet again next year in Alexandria Louisiana and perhaps confer a Texas degree. If I hear anything. You guys will the be first to know. Blake.. these would be cool pictures for the Masons of Texas video you made. good to hear. suggestions are wonderful. I was under the impression that LoT cant confere degrees, Ill have to research that but with most things Im sure it can be dispensated. Correct. (Art 201a, also see Art. 201) Dunno if a dispensation can be had or not. Great! My daily labors are in Texas but my heart and bare feet are still lodged firmly in the gumbo dirt of South Louisiana. DDGM Price, thanks for the pictures. And, congratulations on your successful travels down the road of masonry. I'll be making a few pilgrimages across the Sabine this spring and summer to Franklin, Crowley, and St. Francisville. Did a little sports writing in the old days at the Alexandria Daily Town Talk for the legendary Bill Carter. All my linage was raised in Crowley Lodge and it's past time to get a real taste of what masonry really means at the reinactment of the burial in St. Francisville. How's the old Rapides Parish Coliseum doing these days? Covered two high school state basketball championships and a combination Hank Snow-George Wallace rally there. Ole George really knew his Alabama-LSU football history. 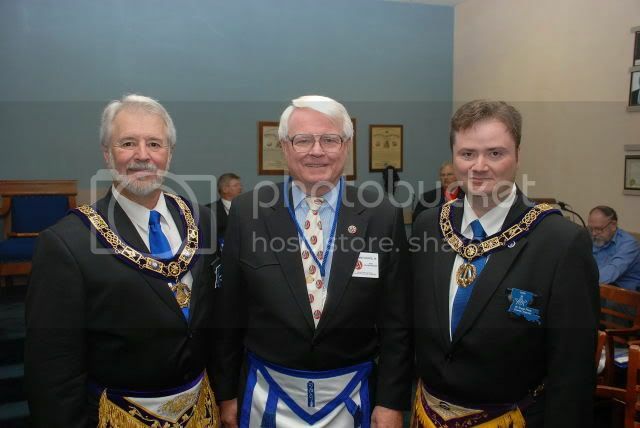 Saw your GM at Waco Grand Lodge last December. Thanks to Louisiana for coming over every year and thanks, to for the charter ... we still got the saddlebag too. Thanks for the kind words. I'm in Winnfield, you know.. where all the Long's are from. Is Gillis still around? Last time I saw him was in the early 70s when he was running for governor. He showed up at the student union building on campus (LSU) and met with about 20 of us. I remember the boy had a high-dollar three-piece suit on and was a talker. I suppose he'd be in his high 80s by now. Yes brother. I remember Uncle Earl and Russell. Don't forget Lady Star! We're both too young to remember the Kingfish, though I did rub my fingers along the bullet holes in the state capital building there between the chamber doors and the elevators.